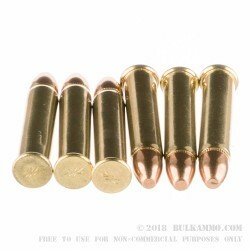 .22 Magnum is a rimfire cartridge popularized for its low cost and ease of acquisition. It’s popular as a target practice round for its superior range to .22 long rifle; however, it also packs enough punch to take on varmint and small game. 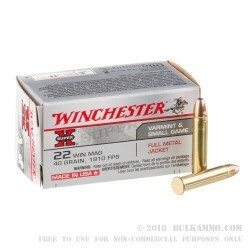 With a variety of weapon options available, .22 Magnum is a great way to increase your accuracy as a shooter without breaking the bank. At mere pennies a bullet, it’s impossible to deny that there’s no cheaper or easier way to put more rounds downrange in one practice session. 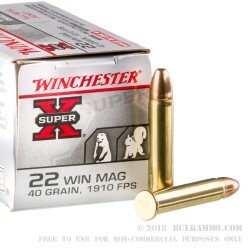 Whether you’re looking to improve your aim with handguns or get better at striking targets far away with your rifle, there’s likely a gun made to fit .22 Mag for your purposes; and you won’t find a better deal to get that gun going than Winchester’s Super-X 40-grain FMJ cartridges. Winchester’s .22 Magnum travels at 1,910 feet per second out of the barrel and produces 324 foot-pounds of muzzle energy. 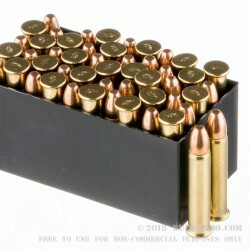 The bullets loaded are 40-grain full metal jacket rounds. The rimfire casings are non-reloadable.